Mirai no Mori needs your support! Join our team and help us reach out to as many youth as possible. If you are Interested, please join our info session to find out more! Black Stripe Theater brings Patrick Marber’s play about men obsessed with gambling to Sangubashi Transmission Theater. Dealer's Choice, Patrick Marber’s debut play, was first performed at the Royal National Theatre (Cottesloe) in London in February 1995 starring Ray Winston, and it won both the 1995 Evening Standard Award for Best Comedy and the Writers' Guild Award for Best West End Play. A 2007 hugely popular revival of the play at the Menier Chocolate Factory was transferred to the Trafalgar Studios and was nominated for several awards. The play is set in a restaurant in London and follows the lives of six poker addicts – Carl, Sweeney, Ash, Frankie, Stephen and Mugsy. The action takes place over three acts and the third act is set around the poker table. 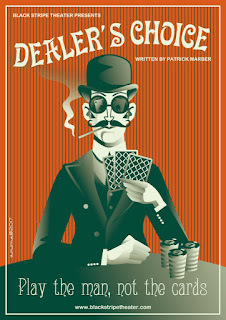 The play is about fathers and sons and the emotional deficiencies of men addicted to playing poker. info and RSVP here https://www.facebook.com/events/280107862419986/?ti=icl Once you get the building, come to the 6F and PM Sarajean (messenger or text) and she will let you in. Miria no Mori needs volunteers! Organizational Development Skills workshop this Saturday! View this email in your browserMarch 2017Happy IWD 2017!! !